Walsingham village lies near Wells-next-the-Sea in Norfolk County. The shrine has two parts, a Catholic and an Anglican one, and three Madonnas, a Catholic, Anglican, and Orthodox. For the complete daily schedule of liturgies, including processions and sprinkling with holy water from the healing well, visit the Anglican site and the Catholic site Original Madonna and shrine from the 11th century destroyed in 1539. One part of it, the Slipper Chapel, was rebuilt in 1896 by a Catholic lady and received a wooden statue from Oberammergau, Germany. Apparently it is rather small and insignificant looking, so a second statue was commissioned to replace the first, this one bigger and carved in stone by the Canadian artist Marcel Barbeau. The Holy House, the main part of the shrine, was rebuilt by the Anglican Church in 1921 and received a stone statue. Besides the small Catholic Slipper Chapel, there is a larger, modern Catholic church on the premises. In it hangs the Orthodox icon, which was commissioned in 1984 by the local Catholic priest as a call to Cristian unity and painted by Archimandrite David, a member of the Russian Orthodox community of St. Seraphim, Walsingham. Their tiny church is located at 63A High Street, Little Walsingham. She is listed in Ean Begg’s index of Black Madonnas. She is listed in Peter Mullen’s “Shrines of Our Lady: a Guide to Fifty of the World’s Most Famous Marian Shrines”, and hers is the National Shrine of English Catholics. She is also listed in Roy Abraham Varghese’s “God-Sent: a History of the Accredited Apparitions of Mary”. A nice English lady, Hillary Ratnasabapathy, recommended her to me for inclusion in this index. Thanks Hillary! Having received these visions and instructions, the question arose as to where exactly this replica of the Holy House should be built. The Blessed Virgin gave a sign: Richeldis was shown a meadow wet with “celestial drops and silver dew sent down from on high”, except for two places in the meadow, equal in shape and size, which were completely dry. Poor Richeldis had a hard time picking one of them, but settled on the one close to two wells. She hired the wisest carpenters to begin with the work, but they couldn’t get anything right. No two pieces would fit together correctly, no matter how much they agonized over this project. Finally they gave up and demanded of their mistress Richeldis that she ask the Madonna for more guidance. As the men went to bed and slept, the lady of the manor prayed fervently all night to Mary for help. So the Blessed Mother took the role of chief builder. She directed angels in the construction and had them move the building to the other location, a little more than 200 feet away. Early next morning, the menfolk came back to their work place only to find everything finished perfectly. There was nothing left for them to do, so they went home. Immediately an endless stream of pilgrims began to flow to Walsingham. For hundreds of years, miracles never ceased, more than the chronicles could contain or witness to. Lame were made whole, blind to see, sailors who prayed to Our Lady of Walsingham were saved from tempests, deaf could hear, people wounded in body, mind, or soul were healed, lepers cleansed, wicked people converted. The second site Mary marked with her miracle dew was not forgotten. Another chapel, dedicated to St. Lawrence, was erected there and the wells became known for their healing properties. What could the two spots of equal size and shape mean? Is it possible that Mary foresaw the simultaneous existence of two shrines in Walsingham, one Catholic and one Anglican, and wanted to make clear that she blessed them both, even though only one was the right spot for her Holy House?! I think so. Someone else guessed the Madonna was just being a trickster and playing games with Richeldis. (F3) I believe she had a very serious concern she could only express through symbols and hope someone might catch on. If she had gotten too explicit, she would have been branded as an apparition of the Devil. 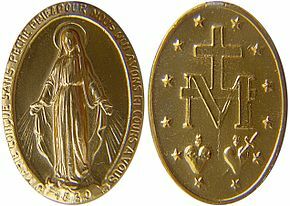 This incident reminds me of Mary’s apparition in Paris in 1830, when she gave the world the “Miraculous Medal” On one side it bears the following symbol: Mary’s letter M with the cross of Christ anchored in it, underneath are the hearts of Mary and Jesus next to each other, equal in size. Mary explained the symbol on the opposite side, but of this one she only said: “The M and the two hearts say enough.”(F4)Seems to me, the image says loud and clear: “Mary and Jesus are inseparable and equal”, but that’s not something one is allowed to say in the Catholic Church, much less in Protestant Churches. Similarly, the two equal shapes Mary drew may have been a promise she couldn’t voice in words at the time, namely that she was going to bless equally her children in both the Catholic and the Anglican shrines in Walsingham and in the Catholic and the Anglican Churches as a whole. Walsingham: Mary’s Attempt to Avoid War? I believe the whole Walsingham project had a lot to do with the effort to bring peace to a world of religious wars and to help Europe cope with the eventual loss of control of the Holy Land in Palestine. Though some people have questioned 1061 as the building year of the Holy House in Walsingham, there is much more evidence to support than to contradict it. (F5) That means it was built before the Crusades and before the actual Holy House of Mary was moved from Nazareth to Loreto, Italy, brick by brick. In order to explain why Mary asked for this construction, we have to look at the historical context. All through the Middle Ages, people undertook pilgrimages to holy places, because the Church taught that this would secure their place in heaven and save them from hell. Until Muslims conquered Palestine and made Christian pilgrimages to the Holy Land increasingly dangerous and finally impossible, it had been considered the most important and effective place for obtaining salvation. Muslims not only interfered with a major Christian way to heaven, they also began destroying many Christian shrines in Palestine. All this was plenty of reason to start the Crusades. At Richeldis’ time the tension was building steadily. To make it really clear how holy the ground in and around Walsingham was, the custom developed to remove ones shoes one mile before reaching the Holy House. This was in imitation of God’s command to Moses on Horeb (i.e. Sinai), the mountain of God, in Exodus 3:5: "Take off your sandals, for the place where you are standing is holy ground." Interestingly, it was also in unspoken imitation of the Muslims, who take their shoes off when entering any mosque. People usually learn something from their enemies and it is not unlike Mary to point out some benefits of Muslim spirituality to her Catholic children. In 1325, a so called Slipper Chapel was built in the neighboring village Houghton St Giles, at the place where one left ones shoes to walk the last “holy mile” barefoot or in slippers provided at the chapel. To make more links to the Holy Land and the Mountain of God, this chapel was dedicated to Saint Catherine of Alexandria, whose tomb is on Mount Sinai and who is the patron saint of pilgrims to the Holy Land in Palestine. All too slowly the Church embraced Mary’s message. Gradually it declared more and more holy ground in Europe. The graves of the Apostles Peter and Paul in Rome had always been important. However, only in Richeldis’ time, Santiago de Compostella, the resting place of St. James, the brother of Jesus, began to be regarded as a holy place powerful enough to grant a pilgrim “plenary indulgence”, i.e. the forgiveness of all his or her sins. (F8) All those places were still out of reach for the common folk of Britain and Northern Europe, so Walsingham was an eternal lifesaver for many. In 1226 the Walsingham shrine received the royal patronage of Henry III. All along the road leading to it were built chapels and refreshment houses, much like on the Way to Santiago de Compostella. After that, 6 more kings and one queen came as pilgrims, along with countless others of all walks of life. In 1538, four years after Britain had broken away from the Catholic Church, the shrine in Walsingham was destroyed and its Madonna transported to London to be burnt. This was done by the orders of King Henry VIII, even though both he and his first of six wives had gone there on pilgrimage. His second wife, Anne Boleyn, intended to go, but he had her executed before she could realize her intention. Only the Slipper Chapel survived the Reformation, though it was desecrated and used consecutively as a poor house, a forge, a cowshed and a barn. Things looked dismal for three centuries. But in 1829 freedom of religion was restored to British Catholics and their ancient forms of worship enjoyed a resurgence. Even in the Anglican Church a certain return to ancient ways was suddenly advocated by the so called Oxford Movement. In 1922, all this in turn inspired the Anglican priest Fr. Hope Patten, the vicar of Walsingham, to rebuild the original Holy House. To do so he had to overcome much opposition from his superiors. With great perseverance he completed the task, this time in brick and stone, in accordance with Mary’s original house in Nazareth, that now stands in Loreto. 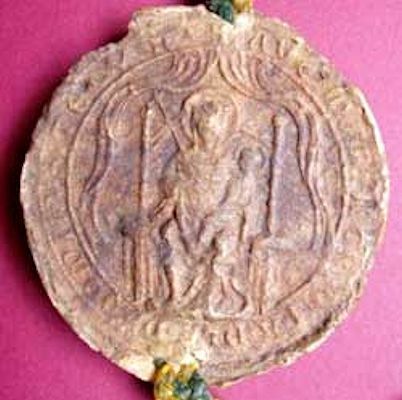 (F11) Father Patten had a stone statue carved modeled after the seal of the former abbey of Walsingham and saw to it that prayers and rosaries would be recited before it every night. On the Feast of the Assumption, 15 August 1934, the Catholic Bishop of Northampton celebrated the first public mass in the Slipper Chapel in four hundred years. Two days later, Cardinal Francis Bourne led a national pilgrimage of the Catholic bishops of England and Wales and more than 10,000 faithful to the shrine. From this date forward, it became England’s Catholic National Shrine. With Vatican II in the early 1960’s, came an opening in the Christian world to interfaith and ecumenical dialogue. In Walsingham old rivals became friends and collaborators. 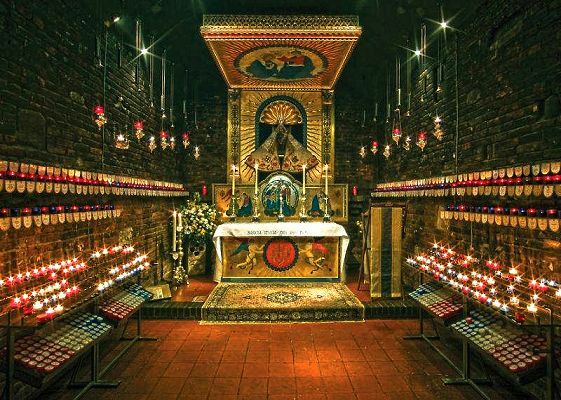 As the Catholic website says: "Unity between all Christians is the constant prayer of the Shrines in Walsingham. "(F13) Nonetheless, when the statue of the Madonna is carried in procession through the village, it still irritates some Protestants. Especially some evangelical Christians can get quite vocal about their disagreements. May they too receive plenary indulgence one day! As so often with shrines that are many centuries old, there are conflicting legends and claims. The Pynson Ballad speaks of two wells near but not under the Holy House and of dry shapes in a wet meadow pointing to the location for its building. Fr. Patten and the Anglican Church mention a healing well marking the very spot of Mary’s House. 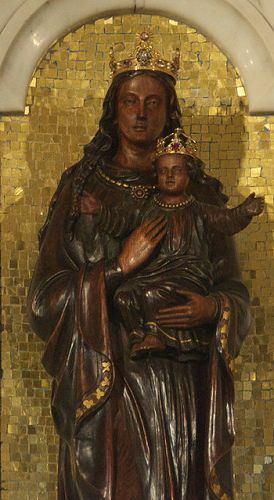 Either way, a typical Black Madonna comes with a sacred source of water and/or a sacred stone and often chooses a place that has been sacred since before the Christian era. It’s nice to know that Our Lady of Walsingham shares these characteristics. Wherever exactly the original holy wells and holy house used to be, let’s remember the spirit of Our Lady’s message: holy ground and holy wells can be everywhere, wherever you find them by the grace of God. They are created by a collaboration between divine grace and the faith of the people. By the grace of God even the most mundane well becomes holy when hundreds of thousands of faithful treat it as such. 6. Visit: www.Medjugorje.org and look up Mary’s message on Oct. 1, 1981 or go to the thesaurus on that site and scroll down to the key word “Muslims”. 7. Mary Craig, "Spark from Heaven: Mystery of the Madonna of Medjugorje", 1988, on: http://www.duversity.org/The%20Day%20of%20Mary.pdf This website is an amazing collection of Mary’s attempts in the course of centuries, to bring peace between religions, especially Christianity and Islam. In Willesden, which is part of the London Borough of Brent in North West London. Similar to Walsingham in Norfolk, there are two sanctuaries dedicated to the Black Madonna of Willesden, a Catholic and an Anglican one. The Anglican St. Mary’s Church is at the original location: 110 Ellesmere Road, London NW10 1JS, It is open all day, every day, except Tuesday. The Catholic Our Lady of Willesden Church is at: 1 Nicoll Rd, London NW10 9AX, 2.3 miles away, also open daily. The original Black Madonna was burnt on the banks of the Thames in Chelsea together with her famous sisters, the Madonnas of Walsingham, Worcester, and Ipswich in 1538. She was carved of dark wood and silver plated, bearing a color "like ebony". The Catholic statue was carved in 1892 from an oak tree that stood on the site of the original church; it’s about 3 feet tall. The Anglican statue was carved by Catherini Stern in 1971 out of lime wood that has been ebonized; it’s about 3½ feet tall. After the Reformation, in order to deter any resurgence of worship of Our Lady of Willesden, the Vicar of the local parish of St Mary's had an enormous fine imposed upon him in perpetuity, for idolatry and superstition, should he dare to hold services at her church. Only at the beginning of the 20th century did a Vicar (Fr James Dixon) dare to throw off this antiquated shackle. Thankfully he was not punished and he set about reviving the shrine. 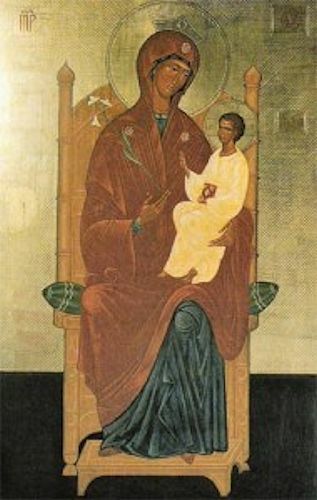 Father Dixon acquired a first image of Mother Mary, which was gilded and installed her in the place where the original Black Madonna had sat. That golden Madonna didn’t engender a lot of interest with the modern faithful; apparently they wanted a black one. 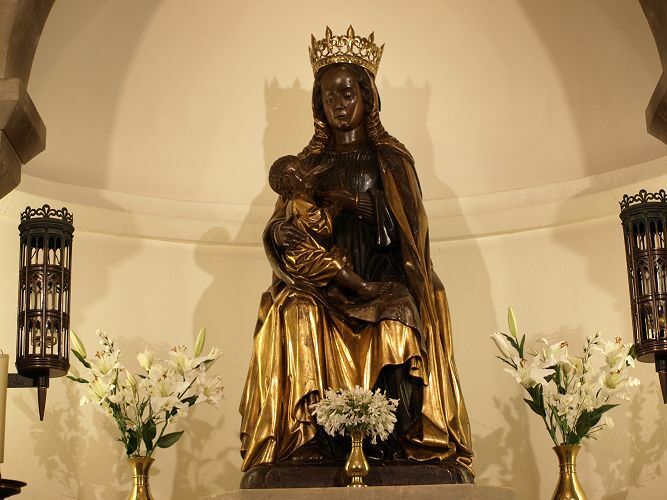 They finally got their wish 70 years later, when a Black Madonna image was commissioned and Bishop Graham Leonard instituted an annual pilgrimages to her. With that, people began to flock to Willesden once again. 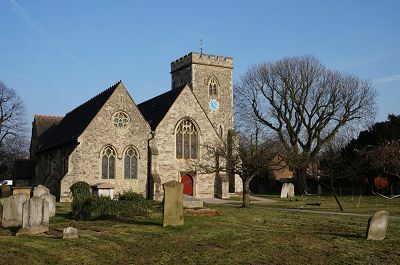 St Mary’s is a perfect example of Anglo-Catholicism, a style of Anglicanism that emphasizes its Catholic heritage and identity. It started in 1833 with the “Oxford Movement” that ushered in a “Catholic Revival”. The Catholic Shrine: Although the parish of Our Lady of Willesden lies 2.3 miles from the original shrine and lacks its holy well, it has been very successful in rousing masses of faithful. How? In 1892, a beautiful Black Madonna was carved from an oak tree that stood in the original church yard. Some say devotion to our Lady of Willesden began with an apparition of Mary to a parishioner in this oak tree and that the holy spring also began to flow at that point.F2 Since 1903, this ‘reincarnation’ (if you will) of the original Lady of Willesden goes through the streets in an annual procession on the second Sunday in May. There is also a torchlight procession the second Sunday in October. In 1954 she was crowned by Cardinal Bernard Griffin in Wembley Stadium, with 94,000 faithful from three dioceses in attendance!F3 In a grand procession the Madonna was carried through the streets of London to the stadium and back to Willesden, 2.4 miles each way. Obviously many Catholics wanted to bear witness to the fact that Catholicism is still alive and well in Great Britain, even after 300 years of persecution and suppression. F1: According to a conversation between Hillary Ratnasabapathy and the vicar of St. Mary’s in 2016. F2: See: a you tube video called: Our Lady of Willesden the Narional Shrine Beautifully done, although the end is sadly divisive. F3: See this newsletter article of the parish. Our Lady of the Taper received the special “honor” of being burnt at the stake in 1538, in Chelsea, London, along with all the other ancient, famous Madonnas of Great Britain. As with most of the others, much of their traditions and histories were destroyed along with their shrines and their records. Thomas Cromwell, chief minister of King Henry VIII, was very thorough in his quest to eradicate all Catholic “superstitions”. Therefore we don’t know for certain how many of the burnt statues bore the title of Black Madonnas. But like her sisters listed in this index under England and Wales/United Kingdom, she shares characteristics typical of our Dark Mothers. Actually, this one more so than the others, echoes certain themes from around the world: She was found in nature, accompanied by a miracle, brought into a local church, but mysteriously kept returning to the place of her finding, until her children understood that she wanted a special shrine built for her in a natural setting. Many Spanish, French, Italian, and Latin American Black Madonnas tell this same story. 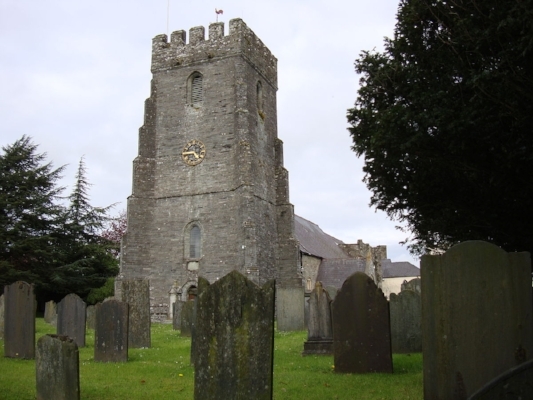 The legend of this Welsh Lady recounts how she appeared on the banks of the River Teifi in Cardiganshire in 1158 with a burning taper in her hand. 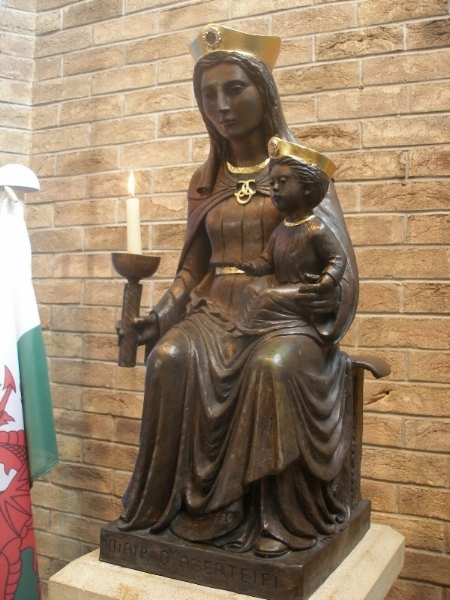 She was a simple, yet beautiful statue and her shrine immediately became a place of pilgrimage for all of Wales. That original church, St. Mary’s, still stands, though the nave was rebuilt in the 14th century. In 1952, Bishop Petit learned that there had once been a shrine in Cardigan and decided to restore it. He commissioned a new statue, which was blessed in Westminster Cathedral in 1956 and placed into Our Lady of Sorrows church. Fourteen years later, a new church, Our Lady of the Taper, was consecrated, and the statue placed in its current home. Unfortunately the statue wore badly, and in 1986 a new statue – in bronze – was installed in the Church on Pentecost Sunday in the presence of 4500 pilgrims. 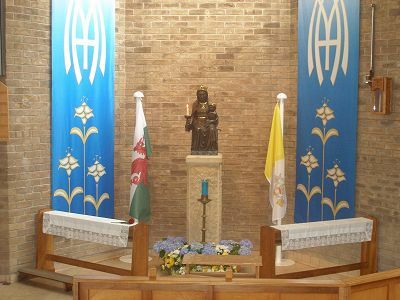 It was blessed in Cardiff Metropolitan Cathedral, and like its predecessor, it toured throughout Wales before being placed in the current Church. In her chapel (above)adjoining Our Lady and St. Anne’s Catholic Church, 2 South View Ave., Caversham, Reading RG4 5AB. Caversham, suburb of Reading, Berkshire county, lies one hour West of London.Original plated with silver, i.e. black from oxidation, life size, burnt at the stake in 1538. Present statue about 15th century also life size, oak. The inscription reads: "The Holy Well of S. Anne the healing waters of which brought many pilgrims to Caversham in the Middle Ages"
Although Our Lady of Caversham does not bear the title of Black Madonna, three things lead me to believe that the original may well have been considered Black. She was plated with silver, which turns black quickly as it oxidizes. She stood “in such a wild place”*1 and was associated with a venerated oak tree at the top of Priest Hill and a sacred well (St. Anne’s Well), which was said to cure many afflictions. This closeness to nature and sacred water is typical for ancient Black Madonnas. In the 13th century she was second among English Madonnas only to Our Lady of Walsingham. Very few white Madonnas became that famous in the Middle Ages. The original Madonna, her shrine, and her memory were so thoroughly destroyed and razed during the English Reformation that we can’t even say exactly where her church stood, much less what the history of the statue was. St. Ann’s well too was lost for many years. It was restored early this century, but still runs dry. What we do know about the shrine is that it experienced a heyday in the 13th century. Pilgrims visiting the shrine, from the south, would first find a stopping place on Caversham Bridge across the Thames, at St. Anne’s Chapel. It too has long gone. The present church is a ten minute walk from the Thames. Medieval worship centered around a wonderful, jewel-encrusted, crowned statue of the Virgin, but the shrine also housed an important collection of relics that had been offered to Our Lady: In 1106, Duke Robert of Normandy presented the spearhead that pierced Christ’s side on the Cross. He had brought it back from the First Crusade and it became the principal relic of England. *2 There was also a piece of the rope with which Judas hung himself, the daggers that killed King Henry and St. Edward, etc. 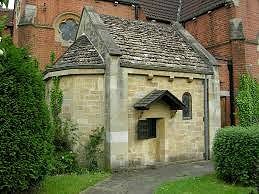 Her chapel was filled with ex voti such as crutches and replica of body parts whose healings were attributed to Our Lady of Caversham. The revival of this shrine began in 1897, the year following the foundation of the Catholic parish of Our Lady and St. Anne, made possible by the freedom of religion act of 1829. In the Marian year 1954, the present chapel was built and this beautiful, Northern European, nursing Madonna bought in an antique shop in London. Since the original was crowned, the new Lady of Caversham too received a crown in 1996. *1 According to a pamphlet available in her present church. *2 It may have been that given by Duke Robert, though it was said to have been brought to Caversham by an angel with one wing - probably a statuette which held the relic.